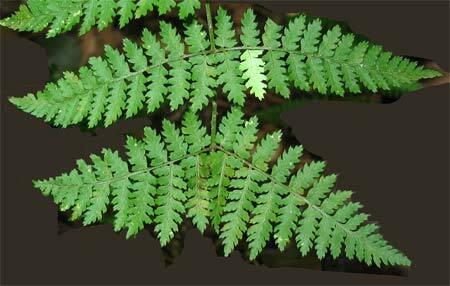 In order to discuss ferns, one needs to become acquainted with fern terminology, which is unique to the study of ferns. In keeping with the philosophy of this website of making the study of ferns accessible to non-scientific naturalists, scientific terminology is kept to a minimum on this website. However, the use of some specialised terminology is necessary in order to talk intelligently about ferns. The terms used in this website are explained and illustrated below. Ferns do not have flowers or seeds. Instead they reproduce by means of SPORES. SPORES are tiny dust-like particles that grow in and are released from structures called SPORANGIA (singular: SPORANGIUM; plural: SPORANGIA). A group of SPORANGIA is called a SORUS (singular: SORUS; plural: SORI). SORI are sometimes covered by a flap referred to as an INDUSIUM. In this photo of Marginal Shield Fern (Dryopteris marginalis)	are several SORI, each one of which is covered by an INDUSIUM. The middle leaflet has seven SORI. The SPORANGIA are the small black or green balls that can be seen peeking out from under the INDUSIUM. So, to summarize ... SPORANGIA cluster together in groups called SORI; SORI are sometimes covered by a flap called the INDUSIUM. The shape, location and pattern of SORI on the underside of fern frond leaflets can be an important identifying characteristic. 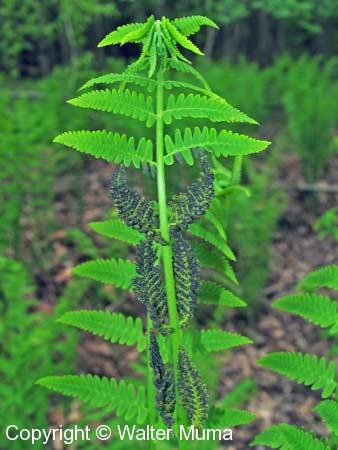 For example, in the photo above, the fact that the SORI are arranged along the very edge of the leaflet identifies this fern as a Marginal Shield Fern (Dryopteris marginalis). But not all ferns carry their SORI in this location. Many have separate fertile leaflets, or even a completely separate and distinct fertile frond or stalk. For example, below on the left is Cinnamon Fern (Osmundastrum cinnamomeum), which has an entirely separate fertile stalk carrying the SORI. On the right is Interrupted Fern (Osmunda claytoniana), which carries its SORI on fertile leaflets partway up the regular fronds. FROND refers to the whole fern "leaf" that rises from the roots. In this photo of a herbarium specimen of a Marginal Shield Fern, the FROND is the entire plant seen except for the root. The BLADE is the portion of the FROND that carries the leaflets - it is above the STALK / STIPE. In the photo, the BLADE is the upper portion arching towards the upper right. The STALK or STIPE is the portion of the FROND that is below the leaflets - it is below the BLADE. In this photo, the STALK / STIPE is the lower portion bent to the lower right. STALK and STIPE refer to the same thing; STIPE is a more correct term than STALK. 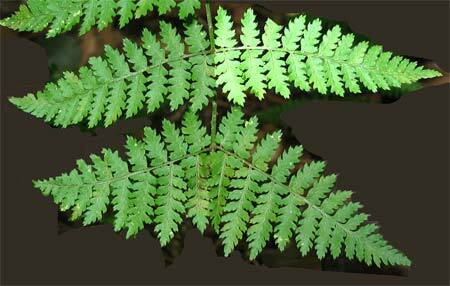 RACHIS is the proper term for the main midrib of a fern BLADE. This photo shows someone holding the RACHIS of a Virginia Chain Fern (Woodwardia virginica). This series of three photos shows the bottom part of an Intermediate Wood Fern (Dryopteris intermedia) frond. The bottom two pairs of PINNAE or LEAFLETS are visible. This photo has one PINNA / LEAFLET highlighted (singular: PINNA; plural: PINNAE). PINNA or LEAFLETS are present on a once-divided or once-cut fern. Intermediate Wood Fern (Dryopteris intermedia) PINNAE or LEAFLETS may be further divided into PINNULES or SUBLEAFLETS. This photo has one PINNULE or SUBLEAFLET highlighted. 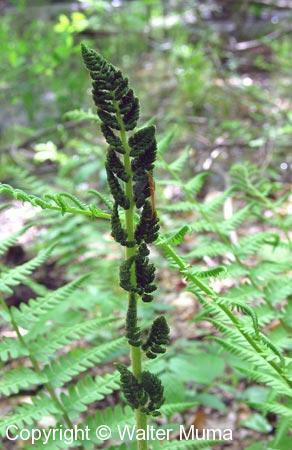 PINNULES or SUBLEAFLETS are present on a twice-divided or twice-cut fern. Intermediate Wood Fern (Dryopteris intermedia) PINNULES OR SUBLEAFLETS may be further divided into LOBES or SUB-SUBLEAFLETS. This photo has one LOBE highlighted (part of the PINNULE that is highlighted in the previous photo). LOBES are present on a thrice-divided or thrice-cut fern. FIDDLEHEAD is the name given to the emerging fern plant in the spring. It is so named for its resemblance to the end of a violin, or fiddle. This photo shows FIDDLEHEADS of Ostrich Fern (Matteuccia struthiopteris).